Thursday 18th April: Meet at 13:00 at the Chevot Centre, Wooler NE71 6BL. This walk is being run in conjunction with the Northuberland National Park. 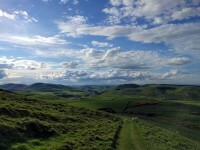 Details of the walk and how to purhaase tkets can be found on the Northumberland National Park Facebook event page. "Ian is the Brian Cox of Northumbria's rocks"